Sunday's Steeler-Raider game featured 21 penalties, including 14 on the Steelers for a franchise-record 163 yards, nearly matching the total of the Raiders offense (182). Who was the official with the historically quick trigger? 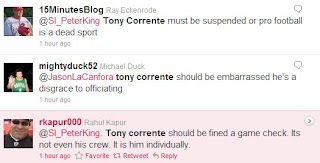 Tony Corrente, an NFL official since 1995 and the referee of Super Bowl XLI. According to Wikipedia, Corrente hails from La Mirada, California (about six hours away from Oakland, conspiracy theorists), and has officiated games at various levels of football since 1971. And according to Twitter, he just might be a hot topic around football discussions this week. As you can see, football writers are being deluged with angry tweets about the ref from fans. And you know what? I'm on board with the anger. As you know, I'm not usually one to blame officiating, but Corrente went hurdling over the line on Sunday. It was the most lopsided officiating in a win I've seen since Pitt's legendary "13-9" at West Virginia, when Big East officials seemed hell-bent at getting the Mountaineers into the national championship. I'm bubbling over with rage after a 32 point win.......and i rarely bother to get too worried about referees. Roger Goddell put the word out on the Silverback and his crew. I honestly hope they get a fair shake the rest of the way because today i was terrified everytime a defender made a tackle. Clearly, Kommissar Goodell wants to make an example of the Steelers. Great. Oh, come on. Let's be fair here. It's been a couple of weeks since anybody on this team was fined, and that just isn't kosher with the boss. The Raiders themselves only gained 19 more total yards than the refs gave 'em. How sad is that? its official...goddell has ruined the NFL. Yup, Goddell is a joke and has created an atmosphere in which the officials (against the Steelers anyway) can't call the game properly anymore and what makes it even more frustrating is Dan Rooney had a big hand in getting this clown his job. Harrison is completely confused on how to behave anymore to the point that he now goes out of his way to help the QB an apologize up after a hit. I look at it this way, if they're going to fine or penalize a player for hits on QB's and receivers regardless of whether it was cheap or not, they might as well make them dirty hits. I wanna see some broken bones, blood and stretchers and then maybe the pansy WR's and QB's in the league will tell Goodell they prefer the way it used to be. 1.) Sanders had his jersey pulled back preventing him from converting a third down. 2.) Ward knocked down in end zone while ball was in air to Wallace. 3.) Intentional grounding on Ben when ball was clearly thrown at Moore's feet ( flag was picked up), Ben was hit late as well on this play. those are just a couple of examples I could think of off the top of my head. Godcomplex has put the word out to slow us down and shut us up. This past week, Woodley suggested there are special rules for Tom Terrific and boom, look at the result of the game. It's just like 2008 when Hines and Troy criticized the refs and then the San Diego game immediately followed. Godcomplex has an agenda to end smashmouth football and turn it over to guys like Brady and Manning who would take a 15 yd penalty or curl up in the fetal position and lose 10 yards befrore they would ever let a defender touch them. A guy who points to the refs and gets a flag because a player came near his knee is the face of the league. Yeah, he can throw a football, but he's not a football player. How does the league go about firing a commissioner and how can Steelers fans make it known to Dan and Art Rooney that we want it to happen? Do we basically have to wait for this prick to die or retire? Right now I hate the Rooneys for giving their blessing on this disaster of a choice for commissioner and until he's gone I'll hold them partially responsible for every bad Goodell created call I see. The only point I'd like to make is to not look at his background for conspiracy theories. Why? Bill Waggoner is a back judge in the NFL. He was the BJ in Super Bowl XL. He was the backjudge that called offensive pass interference against the seahawks that negated a TD. Bill Waggoner is from Pittsburgh. I, personally, have not only met Bill, I've taken a few NCAA ref camp classes with him. He's an outstanding official, and so are all the other NFL officials. They don't pick favorites, they just call the game the way it should be called. Yeah, they make mistakes (they are human), and I'm sure Corrente is kicking himself and getting reamed, not only by the fans, but by the director of officiating (remember, they get graded for each and every play, regardless if there was a violation near them). I really don't think it is as simple as the crew just making mistakes in that game. If they were calling the game tight both ways, I would see that. But that just is not the case today. Couple that in with the 2 calls that lead to the Bengals getting the TD to cut our lead on MNF and it starts to add up. A fullout conspiracy is a ridiculous suggestion. But to let so many things go on the silver and black yesterday and then call us for everything, especially some phantom calls, is a little more than just human error. 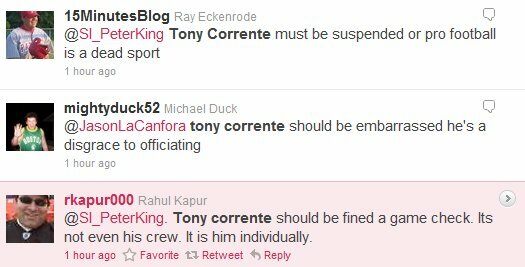 Whatever Corrente gets, he deserves. First off... 6 hrs from Oakland is pretty damn far. Pittsburgh is about six hours from Philly (...and about 6 from Cleveland). That 'late hit' on Harrison was atrocious. Any player BUT Harrison and that's a no call... guaranteed! Say what you want about the refs yesterday, but they let us get away with one on James Harrison's interception... that was clearly an illegal forceful grabbing of the ball and falling on it with his body weight and driving it to the ground... i don't know how they missed that one? What route do you take to Cleveland that is 6 hours? You could ride a pedal bike there in 6 hours. @ BwBw - my point was intended to be that living 6 hrs from a city is a horrible fact to use to conclude that an official is a 'fan' of that city's team. I was just jaggin ya! If the NFL had any integrity, they would've fired this whole crew this morning. However....It's the NFL offices that are to blame for this incompetence & stupidity. It's time for fans to bombard the House of Goodell with phone calls, and that's just what I have done. Let them know that you want to watch football....Not some other nonsense that they've created.